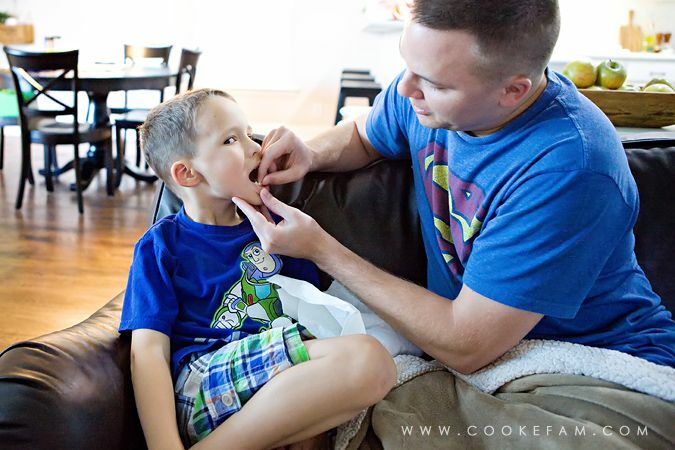 Exactly one week after turning 6, Ethan lost his first tooth. Given the fact that he didn't get any teeth until he was after 1 year old, I am not surprised that he was 6 before losing the first one. And it was really a quick and painless process. We knew the tooth was already loose. Then, Ethan had bitten into something that evening at dinner that made his tooth really loose. I can't remember what it was now. But after one look at it myself, I knew that either Casey or I should pull it because it would be awkward to eat with a tooth that loose. And I knew it would pop right out. Casey got the job since I wanted to take photos. Ethan was a little squeamish about the process but that tooth did pop right out in one second. And after the bleeding died down, he was thrilled. Despite his awkward face, he really was trying to smile...it's just hard to do that and show off the new hole in your head at the same time. 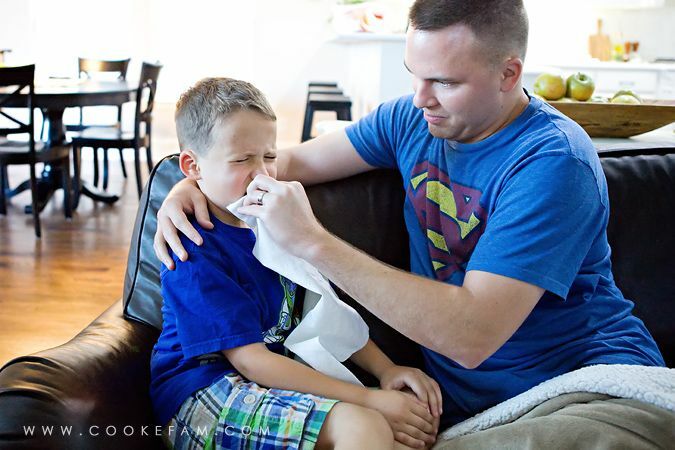 After that quick extraction was over, attentions turned to his tooth pillow and the impending visit from the Tooth Fairy. 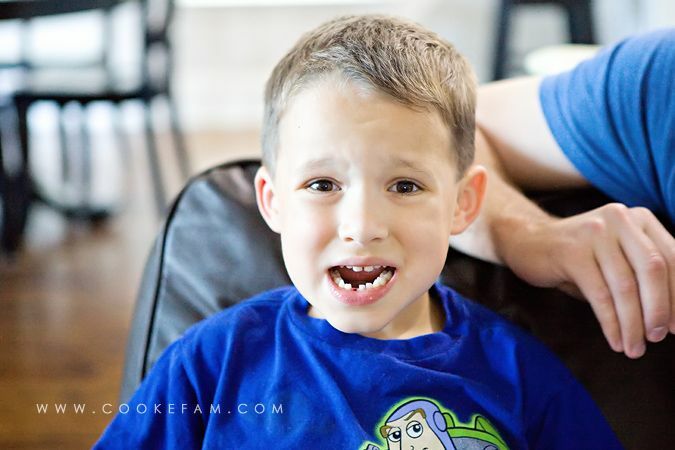 When we discovered his loose tooth a couple of weeks before, I quickly went on Etsy and bought a tooth pillow for him, knowing we would need it soon (and not wanting to make one myself). So, that night, he tucked that tooth in there and hung the pillow on his outer door knob. 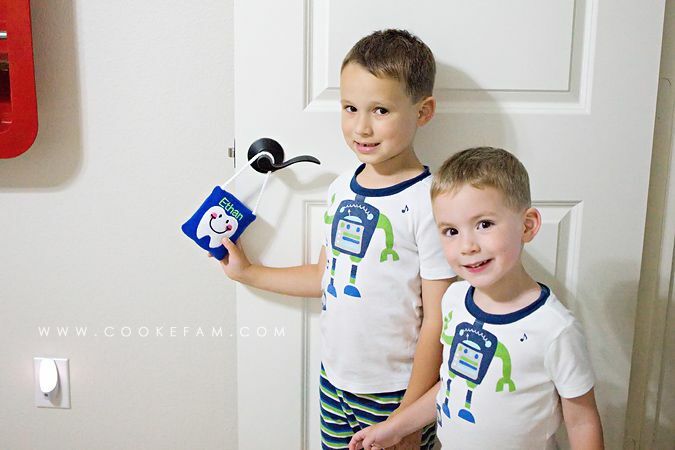 I know when I was growing up, we always put our teeth under our pillow, but I had the idea (since this is our first lost tooth and we can start new traditions easily at this point) to make it easier on the tooth fairy and just hang the thing on the door...on the outside. And the next morning there were some new coins in place of the tooth in that pillow. The Tooth Fairy somehow knew exactly which coins he was hoping for (a penny, a nickel, a dime, and two quarters...all in all, not that tall of an order).